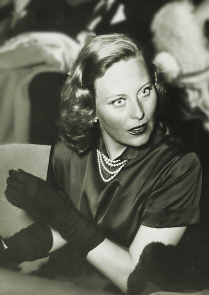 The actress Michèle Morgan was born as Simone Roussel in Neuilly-sur-Seine. She is regarded as Grand-Dame of the French film. She left her home at the age of 15 and took acting lessons. Her career took soon shape and she played small roles in three movies in her debut year - „Une fille à papa - Eine Tochter für den Papa“ (35), „La vie parisienne - Pariser Leben“ (35) and „Mademoiselle Mozart“ (35). It followed soon important productions where she acted besides stars like Raimu, Charles Boyer, Jean Gabin or Pierre Brasseur. To these movies belong „Gribouille“ (37), „Orage“ (38) and „Quai des brumes - Hafen im Nebel“ (38), one of her greatest successes. Already in 1940 - only 20 years old - she was called to Hollywood where she only appeared in few movies because the US filmbusiness didn't have the flair to bring her into play optimal. She played at Humphrey Bogart's side in „Passage to Marseille - Fahrkarte nach Marseille“ (1944) and other movies but she soon decided - although she got the US nationality meanwhile - to return to France. Already for her first movie after her return - „La symphonie pastorale“ (46) she was awarded in Cannes. Her excursion to the USA didn't harm her career, on the contrary. She became a demanded actress in all great film nations and took part in movies like „Joan of Paris“ (42), „Higher and Higher“ (43), „Fabiola“ (48), „Marie-Antoinette reine de France - Marie Antoinette“ (56) and „Le miroir à deux faces“ (1958). With some of the great French stars she worked together in several movies - with Gérard Philipe in „Les orgueilleux - Die Hochmütigen“ (53) and „Les grandes manoeuvres - Das grosse Manöver“ (55), with Jean Marais in „Aux yeux du souvenir - Treffpunkt Rio“ (48) and „Le château de verre - Rendezvous in Paris“ (50) or with her husband Henri Vidal in „L‘étrange Madame X“ (51), „Napoléon“ (55) and „Pourquoi viens-tu sitard?“ (59). Michèle Morgan war married with the actors William Marshall and Henri Vidal as well as director Gérard Oury.